Hello again from Morristown, New Jersey. If you couldn’t see, and you had to team up with your dog to walk to a certain bus stop, take the bus to the train station, and ride the train to another destination, what preparations would you make? Close your eyes and imagine…. What thoughts fears, or emotions might you have? Or, would you consider the trip a huge adventure and go for it? On a beautiful, Sunny day, two of us left with our instructor to practice the bus and metro link with our dogs. We walked about four blocks and waited at the bus stop for the bus. Our instructor gave us some direction, and when it finally came, we hopped on and found our seats close to the driver. We tucked our dogs under the seats, putting one foot on our leash, holding the leash loop in our hand, our dogs’ heads and front legs firmly between our legs. 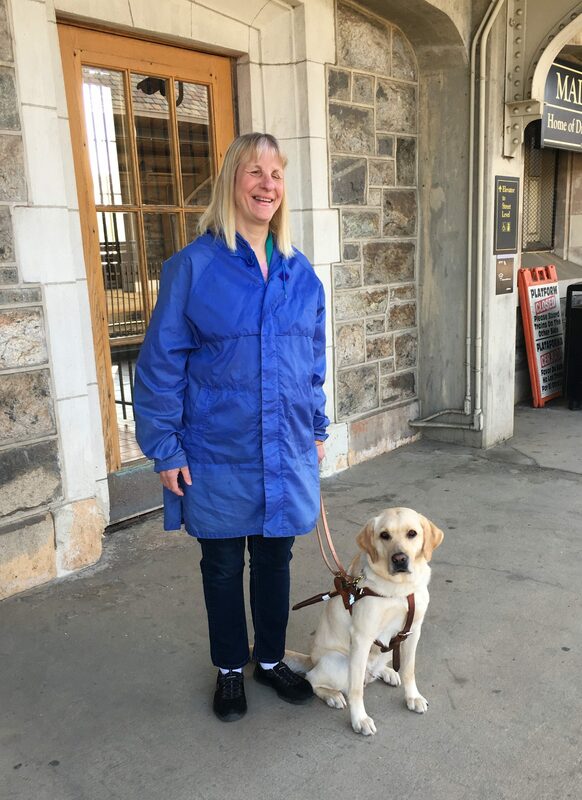 During the 15 minute ride to the train station, my thoughts flashed back to a time when Velda, my first Seeing Eye dog and I were riding the bus. When I started to get off the bus I realized Velda’s harness was half off. Somehow, she had begun wiggling out of it under the seat. I had to quickly put it back in place, buckle it again, and exit the bus. We were safe, and I learned a valuable lesson– Always be aware of what my dog is doing. When we arrived at our stop, we got off the bus and walked several blocks to the station. With the aid of our dogs, and instructions from our instructor, K.O., We found the stairs and took them to the platform. After climbing to the platform, K.O. showed us where the train would come. In fact, she asked us to face the track, with our dog, and tell the dog to “hup up”. Our dogs did not budge. That’s because if they would have, we would have fallen onto the track several feet below. If we have pushed their harnesses to make them go, we could have been seriously injured. Another valuable lesson—K.O. reminded us we are the navigators, our dogs are our guides. We can’t just put our dogs on auto pilot and think they will take us where we need to go. The train came, we got on, found our seats and our dogs lay at our feat, their leashes securely under our foot and loops in our hand. At our destination, we got off, and walked joyfully back to our starting point. Mission accomplished, and new skills under our belts. Here’s our picture at the metro link station. Another adventure with my NEW four-footed friend. You’ll hear from us again, soon. 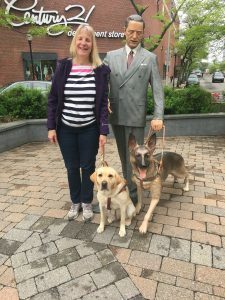 Check out my Adventures with the Four Footed Friend!